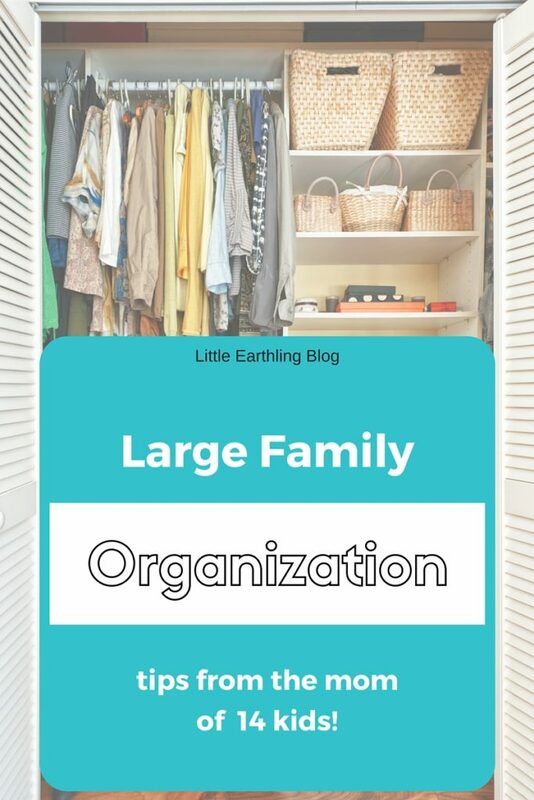 After my last post about laundry in a large family, I decided to answer a few more questions and share a few more of my large family laundry hacks. Its funny, when you are used to doing a rather mundane job (like laundry) a certain way, it never occurs to you that not everyone does it the same way. 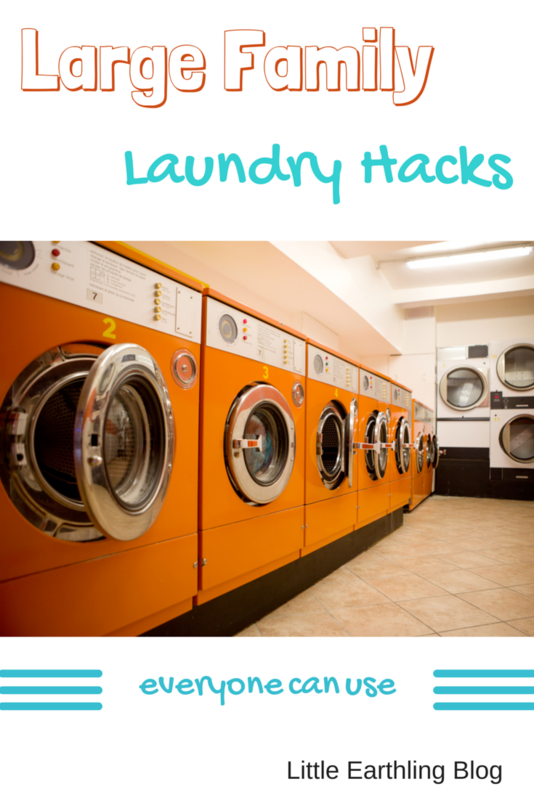 Hopefully this post answers your questions and give you a few new tips to conquer the laundry pile. There is no need at all to stick to traditional baskets. We use these huge storage bins for baskets. 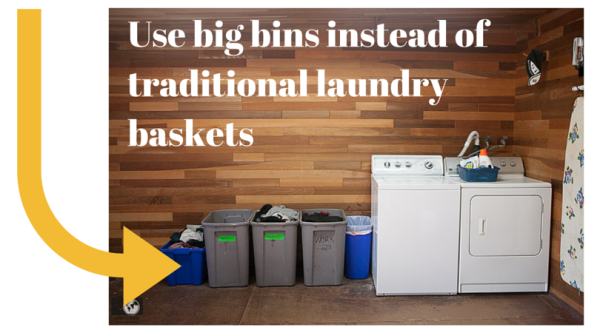 Yes, it means more laundry can pile up, but it is also easy to sort and keep contained. Each of these bins holds at least three loads of laundry. Yes, that m means it has the potential to pile up more, but in our large family we are doing multiple loads daily anyway, and I the bins at least contain the laundry this way! Do you really need to separate you colors? Most clothing is color fast now. Your delicates? If so, great. If not, think outside box. I sort laundry into the following categories: work clothes, pants, shirts, towels/jammies/socks/underwear. This method is easy to use and easy to remember. 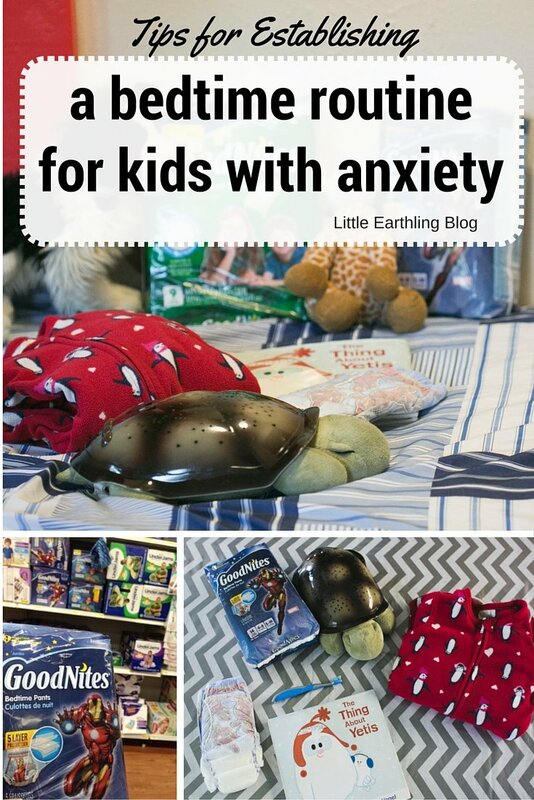 You might also consider sorting by room (makes it quick and easy to put away and often works well for large families) or by boy/girl, or size. 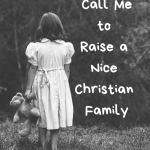 Find a method that works for you family and stick with that. Clothing is made a lot differently now than it was a generation ago when our grandmas ironed everything and needed to separate by color. 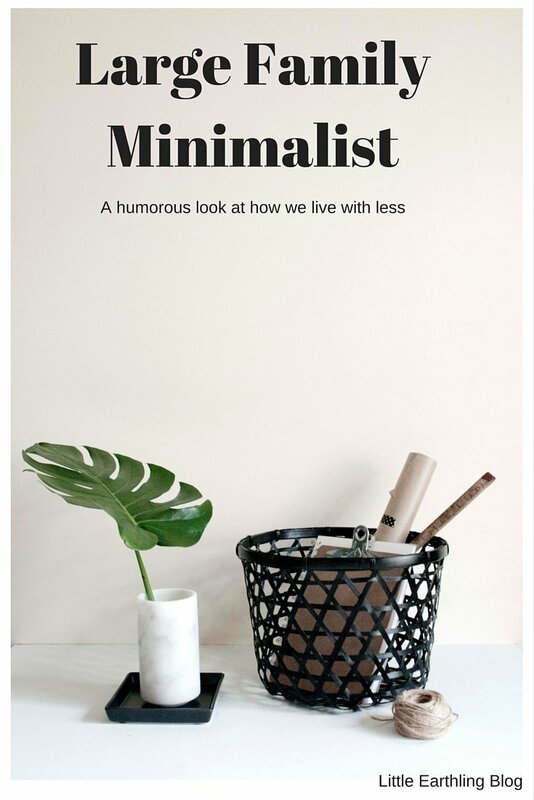 Find ways you can simplify (read labels and check for colorfastness) but I bet there are a few ways you can simplify laundry in your house. ASOS and method laundry detergent have combined to offer easy-to-wash, versatile clothing and cleaning. 3. Prevent permanent stains by writing on your washer. Have you ever had an item of clothing ruined because you (or someone else) put it in the dryer without checking to see if a stain came out or not? We have had countless items of clothing ruined in our house this way. My new method? 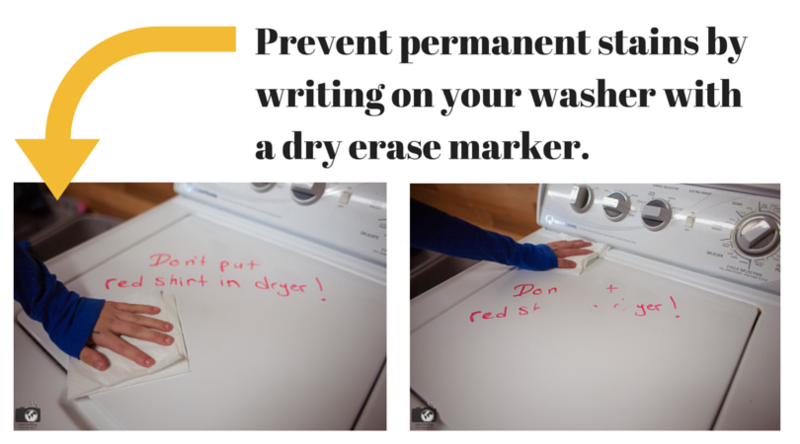 Something no one can miss: write directly on your washer with a dry erase marker! It wipes right off my machine. 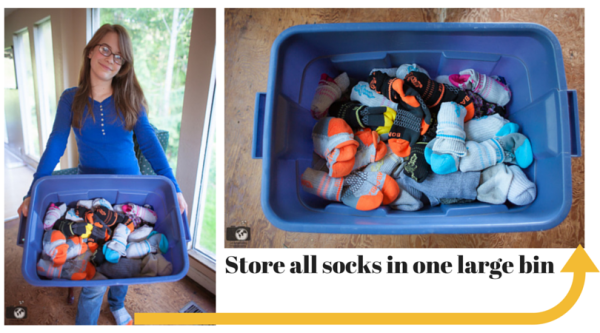 When I fold socks, I throw them all together in one large bin; this way I am not running from room to putting socks for 12 different people away! If some people are motivated enough to dig through and find their own socks, more power to ’em, but I’m not doing it. This large bin is stored in a cupboard in our living room. Easy to put away, easy to find when the kids need socks. I have washed half a dozen pair of shoes just this last week and have been blown away buy the results. See that photo of Apollo’s shoes? The front one I tossed in the washer, the back one hasn’t been washed yet (I wanted to show you the difference). Crazy, huh? That shoe is nearly two years old and looks brand new after going through the washer. I have drying our shoes in the sun or on Chuck’s boot dryer. 6. Choose an effective laundry soap. NEW method 4x concentrated laundry detergent has naturally derived cleaning power that is tough on dirt and stains. 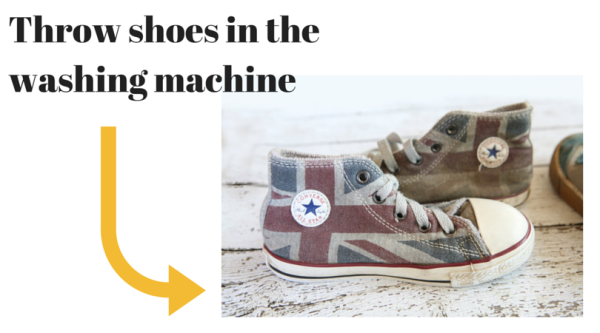 The cleaning power proven to remove tough dirt + stains (even from shoes!) IT keeps colors bright + whites white, works great in cold water so you use less energy for every load and is biodegradable and hypoallergenic. 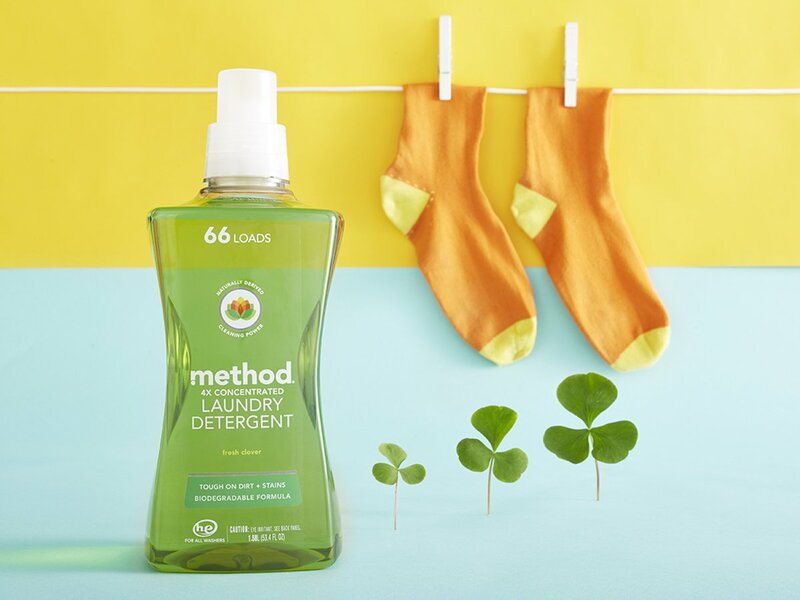 Use the code THREEFORME for $3 off your online purchase of method laundry detergent. I’m amazed to find out that not everybody washes shoes. My mom and grandma both did this. I’ve been washing shoes formt he cradle! It’s a great solution for smelly teen sport shoes. I had the idea to use a dry erase marker on my machine (several months ago before I found this post). It took FOREVER for it to finally come off. 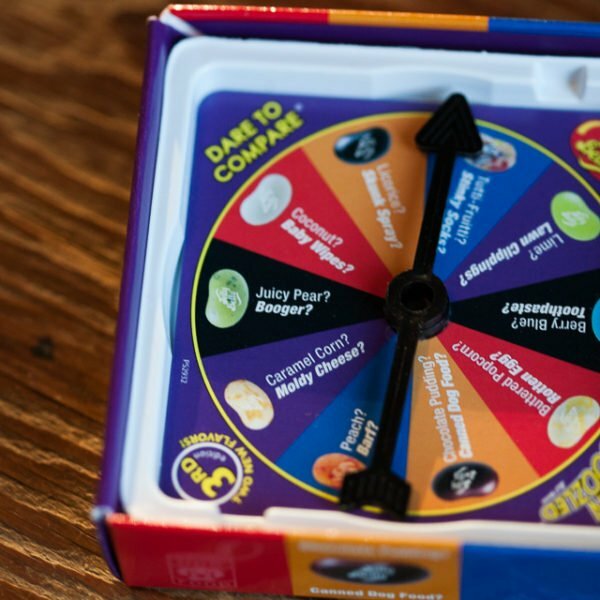 So my plan is to buy one of those little notepad-sized dry erase boards with magnets on it and stick that on top (or the side) of my machine. That way I can use it the same way, but I don’t have to worry about the possibility of permanently staining my machine. Really? It came right off of mine (I tested a small spot first). Your idea is great too though! 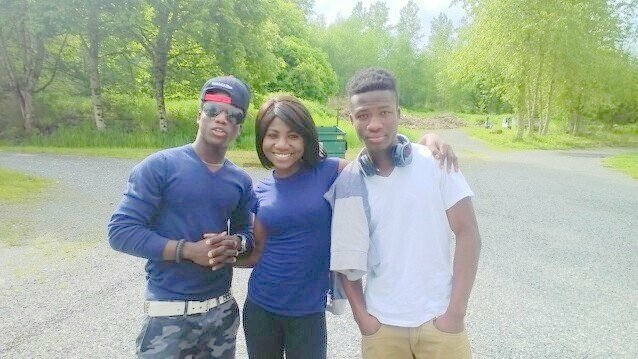 I only have 4 in my family but my mother lives here too. Laundry is a never ending cycle. But at least mom does her once a week or so. 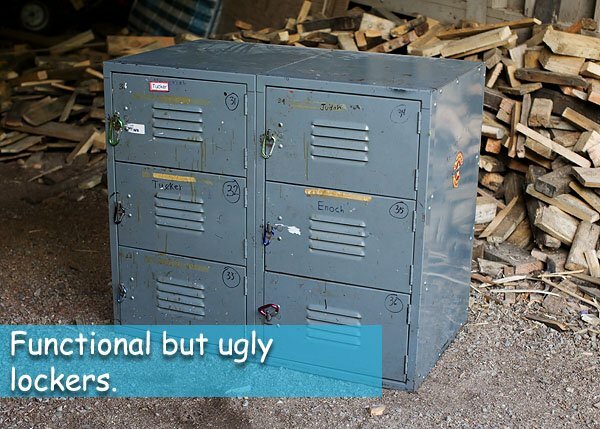 But I can do up to 5 loads a day. 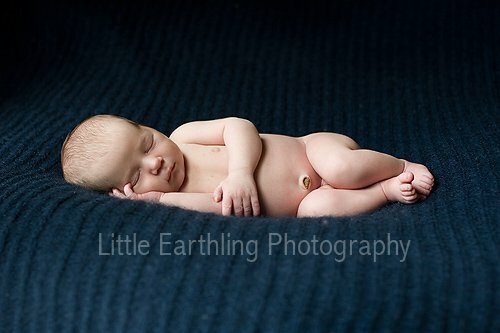 It’s exhausting! Plus laundry room is in the basement and I have to truck it up and down. Tiring!! Yes! I do five loads on a day when I am home. The trouble is..people have to wear clothes *every* day!